From California, with its counterculture heritage, to the fishing ports and mill towns of Maine, millions of Americans in nine states have a chance to vote Nov. 8 on expanding legal access to marijuana. Collectively, the ballot measures amount to the closest the U.S. has come to a national referendum on the drug. Five states — Arizona, California, Maine, Massachusetts and Nevada — will consider legalizing the recreational use of pot. Three others — Florida, Arkansas and North Dakota — will decide whether to permit marijuana for medical purposes. Montana will weigh whether to ease restrictions on an existing medical marijuana law. As the most populous state, with a reputation for trend-setting, California is attracting the most attention — and money — in an intensifying debate over Proposition 64. Silicon Valley tycoons and deep-pocketed donors with connections to the legal medical marijuana industry are among the top financial backers of a pro-pot campaign that has raised almost $17 million. Opponents have raised slightly more than $2 million, including a $1.4 million contribution from retired Pennsylvania art professor Julie Schauer. Advocates on both sides say passage in California would likely ignite legalization movements in other states, especially when the tax dollars start adding up. California’s nonpartisan Legislative Analyst’s Office estimated the state could collect up to $1 billion a year in marijuana taxes. "As California goes, so goes the nation," said University of California, Berkeley political science professor Alan Ross. If "yes" votes prevail across the country, about 75 million people accounting for more than 23 percent of the U.S. population would live in states where recreational pot is legal. The jurisdictions where that’s already the case — Alaska, Colorado, Oregon, Washington state and the District of Columbia — have about 18 million residents, or 5.6 percent of the population. Twenty-five states allow medical marijuana. According to national polls, a solid majority of Americans support legalization. Gallup’s latest survey gauged support at 58 percent, up from 12 percent from when the question was first posed in 1969. Gallup says 13 percent of U.S. adults report using marijuana at present, nearly double the percentage who reported using pot in 2013. California voters rejected an attempt to legalize recreational marijuana in 2010 after campaign leaders struggled to raise money and support for a four-page ballot measure hastily written by the owner of a small medicinal marijuana store. This time, the 62-page ballot measure was crafted by political professionals and has the backing of many elected officials, including Lt. Gov. Gavin Newsom, who is running for governor in 2018. Current Gov. Jerry Brown says he’s close to announcing his position. The measure would allow people 21 and older to legally possess up to an ounce of weed and grow six marijuana plants at home. Pot sales would be subject to various tax rates that would be deposited into the state’s Marijuana Tax Fund. Most of that money would be spent on substance-abuse education and treatment. Some would be used to repair environmental damage caused by illegal growers. Opponents argue that the measure will do more harm than good by opening a marijuana market dominated by small farmers to corporate interests and encouraging children to use the drug through pot-laced sweets like gummy bears, cookies and brownies. The proposal "favors the interests of wealthy corporations over the good of the everyday consumer, adopting policies that work against public health," said Kevin Sabet, co-founder of the California-based advocacy group Smart Approaches to Marijuana. Napster founder and early Facebook investor Sean Parker has contributed more than $3 million to the legalization effort, which has also attracted sizable contributions from an organization backed by billionaire George Soros and another backed by Weedmaps, which rates pot stores throughout the state. "It’s a huge deal and it’s long overdue," said Steven DeAngelo, owner of one of the nation’s largest medicinal marijuana dispensaries and a Proposition 64 supporter. In most of the states with marijuana ballot measures, polls have shown the "yes" side leading. Sabet believes opponents of legalization would attract more support if they could narrow a large fundraising gap and spread their cautionary messages. He does not buy the other side’s argument that nationwide legalization will come sooner or later. "Repeating that this is inevitable, and repeating they are so excited, is part of their narrative to makes folks like us feel helpless," he said. Mason Tvert of the Marijuana Policy Project, a leading pro-legalization group, said his side has a chance to win in most of the nine states, but some losses will not derail the movement. "Even if a measure doesn’t pass, support will grow," he said, citing failed ballot measures in Oregon and Colorado that preceded the victories for legalization. "Most people believe marijuana should be legal. It’s a question of whether opponents do a good job of scaring them out of doing it now," Tvert added. "We might see people opt to wait a couple more years." All five states voting on recreational marijuana have seen intense debate over the effect of legalization in the states that have already taken that step. Opponents of the ballot measures make an array of claims, contending, for example, that Colorado’s legalization of pot has coincided with an increase in crime in Denver and fueled a jump in the number of traffic fatalities linked to marijuana use. 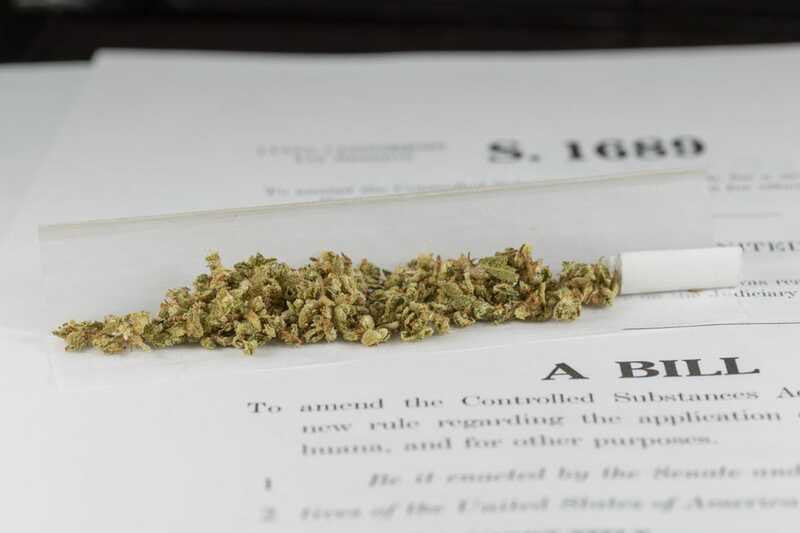 However, an analysis by three academic experts, published this month by the libertarian-leaning Cato Institute, asserted that the impact of legalization has been minimal. "The data so far provide little support for the strong claims about legalization made by either opponents or supporters," the analysis said. Harvard University economist Jeffrey Miron, one of the co-authors of the study, predicted Californians would approve Proposition 64, but he was less certain of the outcome in his home state of Massachusetts, where the Republican governor, Charlie Baker, and the Democratic mayor of Boston, Marty Walsh, have teamed up to oppose legalization. Miron said it’s difficult to predict when legalization might get support in Congress or surge to approval in a majority of states. "I’m not sure if this November will get us to the tipping point. It may be two or four more years," he said. "Certain things seem impossible, until all of a sudden they are possible, and they happen fast." Remove the government from the equation. It does not belong.